A huge parcel arrived yesterday morning! It was early and I still hadn’t got dressed so I opened the door in my dressing gown, unshaven, with great bed hair and a mug of coffee in my hand… Must have made a great impression on the delivery guy. 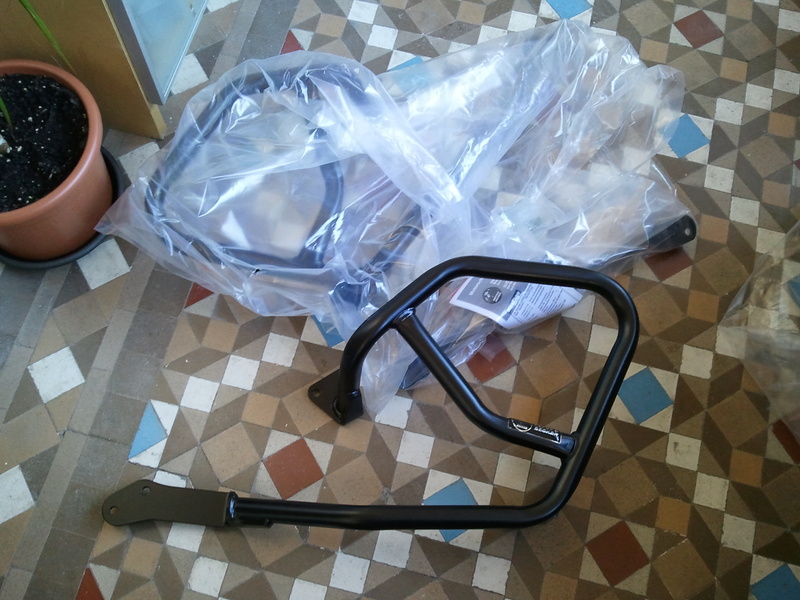 Anyways, after opening the box and removing a looooooot of air bags,I found my new crash bars! I have the original Suzuki ones (still for sale, by the way), but they are too low and while they protect the plastic fairings in the event of a silly fall on tarmac – they have done their job well a couple of times – I’m afraid they won’t be enough if I drop the bike on rough terrain, so I wanted something beefier and that offers protection higher up than these ones. The Hepco & Becker crash bars look great, made from thick steel tubing and great attention to detail. They even have mounting points to install floodlights, nice detail. The only thing that worries me is that they fit both my bike and the later model (2011 onwards) and in the instructions pictures the bar that attaches one side to the other seems to be mounted lower on my model than on the new one – it seems to have slightly raised mounting points. In any case, neither of the bars pictured looks like the one that came with the set and the instructions make no difference between the two models, so it should be alright. I’ll report when I find a moment to install them. This entry was posted in Equipment, Stroming The World 2013 and tagged crash bars, Hepco & Becker by Kilian. Bookmark the permalink.